I had power blackout for most of Friday evening so spent time hugging my notebook and went over some non-desktop software. 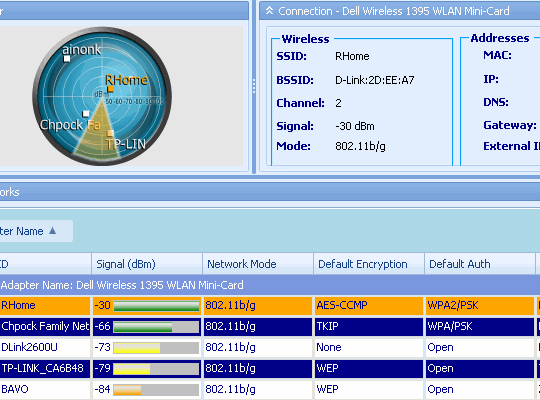 Xirrus Wi-Fi Inspector is app that simplifies locating wireless access points and helps troubleshoot connections issues. App detects all access points in range and breaks info down into meaningful presentation. It uses ribbon interface so may seem somewhat bulky, but parts are easy to minimize or turn off. graph of signal strength for current (and optionally more points) over time. What I liked most is locate feature, must be enabled for access point by right-clicking it in table section. When it is on notebook starts to… click or something like that. More often when signal strength is strong and less often when it is weak. Very practical way to look for spot with best reception. Simple to use with comprehensive information and nice extras. Too bulky for use like constant indicator, but there are slimmer gadget versions for that – see Xirrus Wi-Fi Monitor post at gHacks. By the way their page also lists several excellent third party apps related to networking. Including iperf and TCPview I had covered and more I should definitely check out. on any of the notebook computers and netbooks our family owns. cable modem briefly went down ! share with us seems like a very useful tool. Well, wifi coverage is very underdeveloped around here so for me it’s more of troubleshooting tool than looking for somewhere to connect. Wireless Internet is nice but pricey. I am eyeing newish 4G WiMax network which has unrivaled unlimited plans (~$10 for 512Kbit/s) but coverage is tiny so far. wireless is GO ANYWHERE ! of 1-million in a metro area of another 1-million people). you just chance upon being rare here. Most mobile Internet around here charges for megabyte and a lots unless you go for large 5-10GB packages. This new 4G is first to offer unlimited for sane price. sticks are free with 3 year contracts. if you are in remote locations. $30 monthly seems expensive for a modem, around here 3G modems costs $50-$100 total. I had recently found interesting option of 144Kbit/s (CDMA 1x) for only $8 (eight) monthly. If there are no caveats I am likely to go for it, cheap and no traffic limit is epic win for wireless Internet connection. Just wanted to let you know that the new version of the Xirrus Wi-Fi Inspector is out!